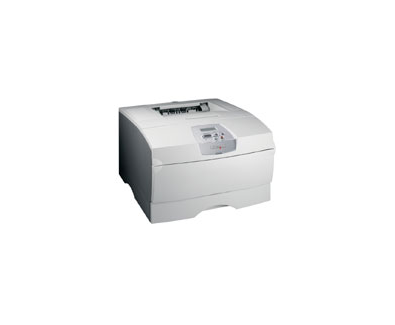 Armed with automatic duplex printing and high-yield toner cartridges, the Lexmark T430d mono laser provides a cost-efficient path to performance, ease-of-use and professional, high-quality output! Make your printer fit your specific needs: Integrated networking easily supports small workgroups; Choice of 250- and/or 500-sheet optional stackable drawers for additional paper capacity; Four input sources for convenience in printing different types of media; Parallel, USB or Ethernet support; MarkVision network management software included; Small footprint and low profile. Complex jobs print quickly: Fast 30 ppm A4 printing with 8 second time to first page, a 366 MHz processor with 32MB of memory. Printing made easy: Easy to read LCD op panel; Easy to install high-yield single-element toner cartridge greatly reduces the intervention rate; High yield, single element print cartridge keeps your office productive and efficient with less ordering and fewer replacements. Print the way you want to print: High quality results on a range of media weights and types; Low total cost of printing; Standard automatic duplex for customer convenience, flexibility, and paper savings; Robust monthly volume of up to 65,000 pages. 258 x 406 x 425 mm. 390 x 515 x 515 mm. 250-Sayfalık Kağıt Besleme Çekmecesi, 500-Sayfalık Kağıt Besleme Çekmecesi, Yazıcıya takılan ilk opsiyonel kağıt besleme tepsisi 250-Sayfalık olmalı.